Learn about the newest updates to TritonEd. TritonEd has new features and fixes that may be helpful to faculty and students! Check them out below. UC San Diego now has an institutional license for Zoom, a web and video conferencing tool. Faculty and Teaching Assistants can use Zoom in their courses to meet with students and researchers, hold virtual offices, and more. Only instructors hosting the Zoom session need Zoom downloaded - participants can join freely. Read more about getting a UC San Diego license and license types. UC San Diego now has an institutional license for Qualtrics, and Online Survey Tool that makes it easy to create, deploy, and analyze the results of surveys. UC San Diego students, staff, and faculty can access Qualtrics directly at ucsd.qualtrics.com using their Business Systems or Active Directory credentials. UC San Diego has acquired a license for Gradescope, a web-based set of grading tools that uses machine learning to help instructors grade exams and homework more efficently, as well as provide insight into student performance. 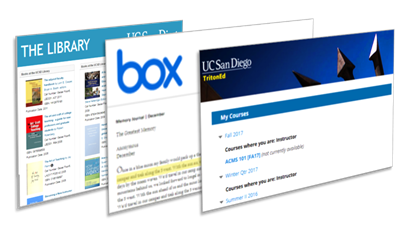 Instructors simply need to use their UCSD email address when using Gradescope to take advantage of the license. Upon request to edtech@ucsd.edu, instructors can link their TritonEd course rosters with Gradescope and sync grades from Gradescope with a column in their Grade Centers. Please send this request from your UCSD email address and include the course title.